On the grounds of Segera—an award-winning, 50,000 acre wildlife eco-safari retreat in Kenya, East Africa—sits the NAY PALAD Bird Nest Villa. Made in collaboration with NAY PALAD and architect Daniel Pouzet, this exclusive destination offers a unique place to stay in the heart of the African bush. Crowned by branches and resembling a gigantic bird nest, the villa offers a 360-degree bird’s-eye view of the surrounding African wilderness—above the treetops, the nearby river, and the wildlife below. Following an adventurous approach by foot or by car, guests can come upon the two-floor structure towering up, out of the plains. Under the setting sun, scattered lantern-light welcomes them up into the retreat to discover an assortment of goodies, including champagne to toast the night ahead. While it’s designed for two, the nest can sleep more. There’s a cozy first-floor bedroom, supplied with crisp, luxury linens and toasty hot water bottles; however, there’s always the option of a night beneath the stars on the open-air top deck. Despite its remote location, the villa offers full luxury service, and is also equipped with solar-heated running water in the bathroom. As a new day dawns, guests awaken to the sounds of the savanna and are able to enjoy a picnic breakfast as elephants and giraffes gather on the neighboring riverbanks. The NAY PALAD Bird Nest Villa offers a 360-degree bird’s-eye view of the surrounding Kenyan wilderness. In addition to the top-floor nest area, there’s also a cozy first-floor bedroom. NAY PALAD shared images of local Samburu women welcoming the unique accommodation. The upper-level nest area is a romantic place to spend time stargazing. 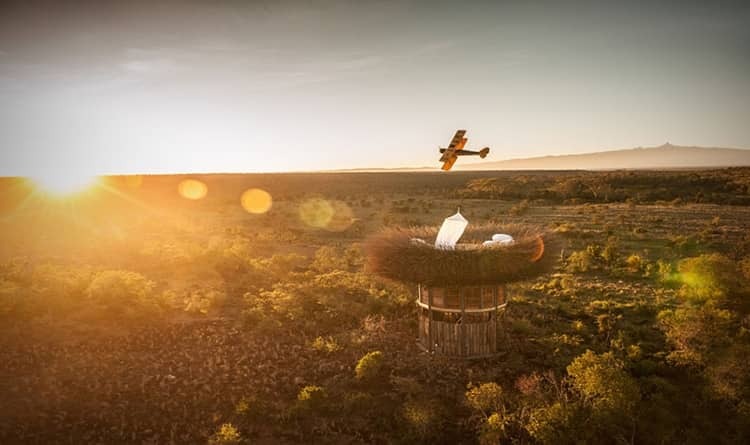 The post You Can Stay Overnight in This Bird Nest Villa Built Above the African Wilderness appeared first on My Modern Met.